Australia’s rising stars claimed their regional title, beating arch rivals New Zealand in the final. Neither side were playing their superstars but a few of Australia’s youngsters showed enough physicality to suggest that several will soon be playing in the World Series. They drew first blood through Mosby and when McGregor strolled over the line with 30 seconds to play in the first term a 14-0 lead had opened up. A rock solid defensive line and similarly improved work at the breakdown forced the Ferns into uncharacteristic handling errors and from those, Australia capitalised. New Zealand did their fair share of capitalising as well - scoring a pair of tries either side of half time to set up the grandstand finish all the neutral Fijians fans were hoping for. But through some awful refereeing the Australian defence held firm and forced another mistake, booting the ball into touch to record a breakthrough win. The two teams may have been composed of rising stars, but they were far too strong for the rest of the teams in the tournament. 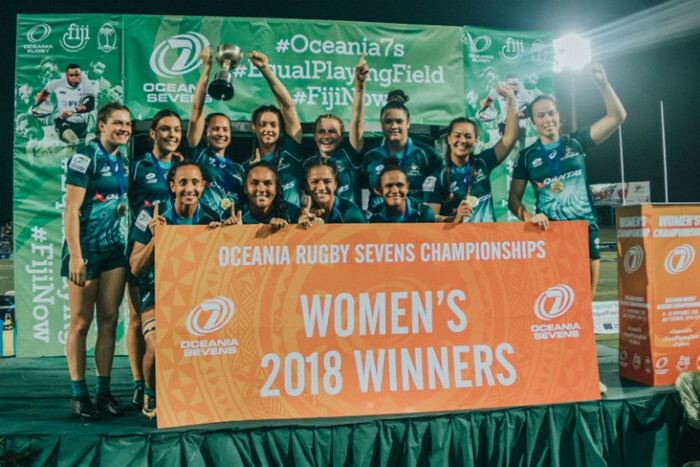 Both reached the final without conceding a point – even to fellow World Series team Fiji, who fell 27-0 to New Zealand in the pool phase and 29-0 to Australia in the semi-finals. Fiji still recovered to take third with a strong 33-5 win over Papua New Guinea to cheer the home crowd in Suva. The other headline from the tournament was the international debut of Nauru who predictably struggled on Day One, but in the plate competition they made Cook Islands work hard for their 19-0 win in the semis, and in the 7th place playoff scored their first international try in a 21-7 loss to New Caledonia.